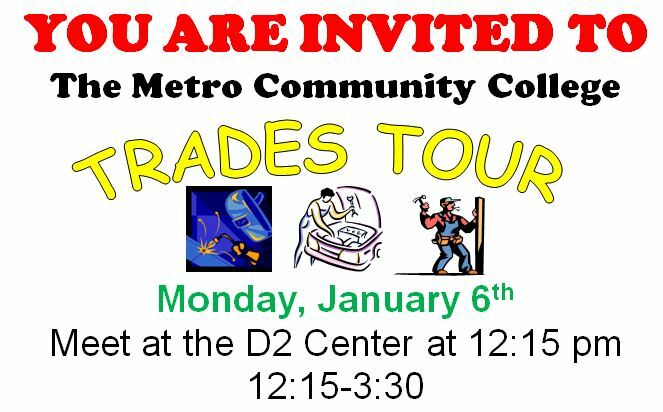 D2 Center students, please join us for a Trades Tour at Metropolitan Community College on Monday, January 6, from 12:15 – 3:30 PM. Meet at the D2 Center at 12:15, where a bus will pick you up and take you to the South Metro campus, arriving at 12:45 and touring until 1:45. 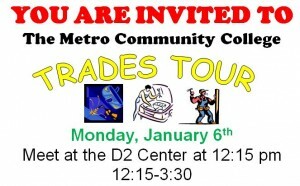 Then you’ll ride the bus to the Applied Technology Center and tour from 2 until 3:10. After the tour, the bus will take you back to the D2 Center and should arrive around 3:30. This is a great opportunity to learn more about possible future careers! Questions or to sign up, please call Ebony at 402-502-8534.